2) The need to alter the position of the rear sight staff in order to provide a clearer sight picture. Take your rifle to a safe place (without any ammunition) and set it up just as you would for a match. Use a gun cleaning cradle, shooting bags, or your cross-sticks. Run the rear sight up to a setting of 175-180. Now look through the rear sight eye cup at a target located 700, 800, or more yards away. Pick out a house, a large tree, or some other object that you can see through your rear sight. Now look through both the rear sight and your front sight, just as you would if you were aiming at a target in competition. If your rear sight staff is in its standard position it should be perpendicular to the bore line of the barrel. If it is, you’ll have a distorted view of the target with the rear sight eye cup run up to this position. Why? Because the eye cup on your rear sight is up so high that you’re having to look down at the front sight, rather than through the front sight as you would if it were down lower. The bottom portion of the threaded shaft of the eye cup is actually partially blocking your view of the front sight. Now, while still looking through the rear sight, gradually lean the top of the staff of the rear sight forward toward the end of the barrel. 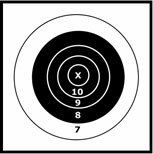 As the rear sight staff is leaned forward, you should begin to see a clearer picture of the target, with any glare or distortion greatly diminished or eliminated entirely. This is because the threaded shaft of the rear sight eye cup is now pointed directly at the front sight, not several inches above the front sight as it would be if the staff were in its normal vertical orientation. Look at the pictures below to see the difference. Notice in illustration “A” that the difference in angle between the red and blue lines is very small. That means that the shooter’s perfect line of sight directly through the threaded shaft of the rear sight eye cup represented by the blue line (i.e. 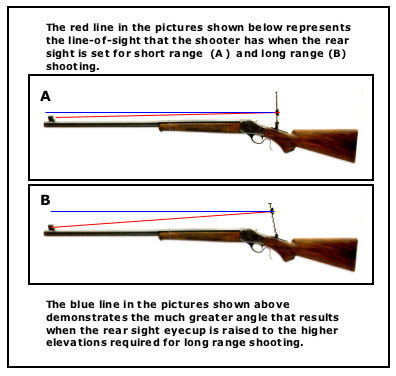 horizontal to the bore line of the barrel) is very close to the actual line of sight through the front sight (i.e. what your eye is seeing) represented by the red line. Notice in illustration “B” that the difference in angle is much greater. Also notice in this illustration that the rear sight staff has already been leaned forward several degrees to compensate for this factor. Now the threaded shaft on the rear sight eye cup is pointed directly at the front sight and the shooter’s sight picture has been greater enhanced. The problem is worse for those of you who have a shorter barrel (30”) than it is for those shooter’s who are shooting a longer (34”) barrel. The angle with the rear sight elevated is even more pronounced with a shorter barrel than it is with a longer barrel because the sight radius is shorter (i.e the distance from the rear sight to the front sight). The cure for this problem is to loosen the screw holding the rear sight staff in position and tilting the staff forward until a clear sight picture is obtained — then tightening the screw to hold it in place. After you have completed your Long Range match, be sure to move the staff back to its vertical position if you are going to use your rifle again to shoot shorter distances (i.e. BPCR Silhouette, Schuetzen, etc…).